Golfers can use deep breathing to combat stress. Many athletes use sports as a way to combat stress. They may hit, throw, run, kick, or jump. 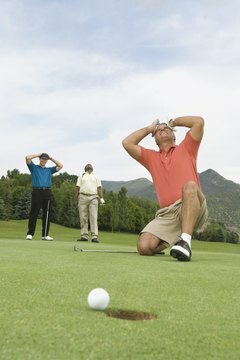 Golfers are forced to confront stress in a different manner as most of their game is spent waiting and walking. This leaves plenty of time for negative self-talk, self-criticism and doubt to creep in. Anxiety and nerves will undermine a golfer’s performance if he doesn’t learn how to cope with stress and stay calm. One of the simplest ways to combat nervous tension is through deep breathing. When we experience stress or anxiety we tend to breathe rapidly and shallowly--some people even hold their breath. This reduces the amount of available oxygen in the body, increasing feelings of tension and strain. Deep breathing helps to reverse this situation. When you find yourself feeling pressured or anxious, the first thing you should do is move away from other people. Find a quiet place by yourself and choose a comfortable position to rest. Whether standing or sitting, keep your back straight and don’t slouch. Then place one hand on your chest and the other on your stomach. Draw a breath in through your nose, while silently counting to five. Slowly blow the air back out through your mouth while counting to eight. Focus on the expansion and contraction of your stomach muscles during this process. Use your abdominal muscles to pull air in and to push it back out. Repeat this exercise 10 times or until you feel calm and centered. Once you have mastered deep breathing, you may find it helpful to add a few visualizations to your relaxation routine. Close your eyes as you inhale and imagine yourself in a place where you feel peaceful and calm. Choose a setting that appeals to you, such as a tropical beach, the woods in winter or the lake at sunset. Try to picture the setting in as much detail as you can, adding specific sounds, scents, tastes and textures to your image. Alternatively, if your sole source of stress is game-related, imagine yourself making the perfect shot or teeing off with a perfect swing. Focus on what is good about your game and what you enjoy, and then imagine your self overcoming any areas of weakness. When you feel the stress is under control, take a moment to release the tension in your shoulders. Golfers tend to hike their shoulders up toward their ears when their game is not going well, increasing muscle tension in an area that is critical to game play and further reducing the odds of an outstanding performance. Reach across your body with one arm and place your hand upon your shoulder. Moving your fingers in a circular motion, press firmly upon the muscles located directly above the shoulder blade. Move your fingers from your neck to your shoulder and then back to the neck. Repeat this technique on the other shoulder, relaxing your muscles and releasing pent up tension. Continue deep breathing as you massage, focusing on keeping your shoulders lowered, and expanding and contracting your abdomen.